In an effort to be culturally sensitive and almost compulsively polite, we've mangled the meanings of words like: "martyr," and "suicide" to such a degree that we're using them to label mass murderers. While American and foreign media collectively increase the suffering of babes through their current fashion of cynicism, others seem to have a case of parents' guilt--unable to give the Iraqi suffering the undivided and ameliorative attention it requires. Instead, reporters rush at any sign of distress to hyper-focus on the negative, and thereby create yet more problems than originally existed. They shovel out body counts masquerading them as reports. A major US magazine recently published an unsubstantiated piece about the desecration of the Islamic Holy Book by US Forces. This story led to riots and many deaths. The magazine has apologized, but it’s too late. The people are dead. I have participated in, perhaps, one hundred raids. I lost count long ago. In practically every Iraqi home, I have seen the Quran. Soldiers have been trained to leave the Quran alone. American soldiers rarely will even touch the green tome, they leave it where it sits, in special places in many homes. Nevertheless, one story—for which the magazine quickly apologized—spelled death. Yet, against the wishes of the enemy, and even much of the media, somehow the Iraqis continue to progress. I am amazed at the strength of the Iraqi spirit. These people keep trying, and they love their children. The combined pressures of an increasingly engaged Iraqi populace, coupled with an increasingly effective Coalition military response, are working to cordon and curtail the insurgency in some areas, while it flares in others. The insurgents’ tactics are backfiring in many areas; their ranks are thinning in Mosul. Insurgents are in the disruption business. Bombs and bullets are their main currency. Like every enterprise, they must control costs. Distant viewers who acquire perceptions of bombs from movies or the nightly news might have a false idea that explosives are high-end items, requiring specialized technical skills and scarce raw materials. Actually, making bombs—such as car bombs—is simple. In most cases, in Iraq, the enemy collects munitions such as unexploded artillery shells—available by the truckload, and cheap—then rigs the shells to explode by one of several easy methods. These are loaded into a car, where a switch is added. A switch that a clever junior high-schooler could make. That’s it. The bomb is ready. The size of the device is limited primarily by the capacity of the vehicle. The Chinese first began using gunpowder a thousand years ago, and quickly realized that making a bomb and using it effectively are different problems. They made rockets from bamboo, and invented grenades. The real challenge comes in making the explosions connect with a target at the right time, in the right way, meaning there is an optimal point and moment for initiation. Achieving both of these simultaneously can be extremely difficult. What's true for simple IEDs also holds for large car bombs against armored targets—if the timing is off, by as little as a quarter-second as the vehicle drives by… BLAM! …everyone inside the vehicle might be fine. When the timing is spot on, everyone can be killed. For armored targets, if the bomb doesn't make direct contact, or nearly direct contact, the effect is usually minor. (Unless the bomber is highly sophisticated; there are few of these in Iraq.) The enemy in Iraq is mostly relatively crude. What they lack in engineering finesse, they try to overcome with more explosives, often resulting in shattered neighborhoods. The enemy’s operating practices for overcoming delivery and timing problems speaks volumes about their predatory nature. They use human bomb delivery devices—the miss-labeled "suicide bombers"—who become organic elements of primitive weapon systems. They call these temp workers "martyrs," in a shameless exploitation of the naïveté and narcissism of certain young men. These so called “martyrs” are not unlike men volunteering to steer torpedoes into the hulls of ships. The "martyrs" allow themselves to be used as targeting and acquisition systems. More than just "allowing" they actually see the act of mass murder as the fulfillment of a glorious plan. Let's start with the BIG words: suicide-bombers and martyrs. Suicide is a term that should evoke empathy, if not sympathy, for a lonely and despairing act. A distressed soul, harboring a crushing, agonizing lebensmude, weary of the strain of a terrestrial existence, perhaps seeking mere relief, or just an end to psychic pain, may be contemplating suicide. If this person straps a bomb to his or her chest and walks out into the solitude of the desert and detonates, they would then be properly called a "suicide bomber." But when the media reports every day on "suicide bombers," they are talking about different people. The word martyr is derived from the word "to witness." It is used to describe a person who is killed because of a belief or principle. Given the choice to recant, martyrs chose instead to face their murderers and stand in witness to their beliefs. True martyrs do not kill themselves, but stand their ground and fight in the face of death to demonstrate the power of their convictions, sometimes dieing as a result, but preferably surviving. The only martyrs I know about in Iraq are the fathers and brothers who see a better future coming, and so they act on their beliefs and assemble outside police stations whenever recruitment notices are posted. They line up in ever increasing numbers, knowing that insurgents can also read these notices. The men stand in longer and longer lines, making ever bigger targets. Some volunteer to earn money to earn a living. This, too, is honorable. Others take risks because they believe that a better future is possible only if Iraqi men of principle stand up for their own values, for their country, for their families. Theses are the true martyrs, the true heroes of Iraq and of Islam. I meet these martyrs frequently. They are brave men, worthy of respect. In Mosul, the enemy has two main faces: The Former Regime Elements (FRE), and the extremists. The extremists here in Mosul can be divided into five groups—more or less—one of which would be the local chapter claiming affiliation with the so-called Al-Queda gang. The goals of the FRE and the extremist gangs are at stunning variance. In fact, they mostly hate each other, often kill one another, and work together only as needed. If the Coalition and new Iraqi government were not here, conveniently located as a central target, the FRE and other terrorists would almost certainly be at war. The main goal of the FRE is simple: Under the former regime, they were in charge. They want to be in charge again. In Saddam Hussein's regime, the Cynic's Golden Rule—"He who has the gold, makes the rules"—worked both ways: "He who makes the rules gets all gold." The bandits made the rules and controlled the gold. The FRE have an understandable nostalgia for the good old days. They liked being in charge. They despise the prospect of people they once persecuted, such as the Kurds, suddenly acquiring any voice whatsoever. It’s not as if the FRE are totally disenfranchised, but that they are no longer in complete control. Whether or not someone might agree with the FRE, there is little dispute that these people have rational goals. Yet rational does not imply tenable in a newly democratic Iraq. This situation is not burdened with nagging grey areas where battle-scarred former combatants can work to some diplomatic compromise. This is an either/or situation. If the new democratic system takes hold, mathematics dictates that the FRE are not going to be in charge; they are outnumbered two to one. The FRE are Sunni Ba’athists while the majority of Iraq is Shia. The FRE is trying to destabilize the new government while simultaneously leveraging their position. Their primary strategy for both is to use violence against government officials and the civilians who elect them. The FRE—being essentially rational but also essentially brutal—are simple to understand. They are serious, often deadly, but are not fanatical in the degree of their personal commitment to the cause. If they die, they will not regain control. It's a fact here on the Iraqi battleground—though seldom mentioned—that the majority of FRE insurgents are climate-sensitive. They almost never attack when it’s cold, raining or even muddy. As a rule, if conditions are such that the Little League baseball game back home would be canceled due to inclement weather, the insurgents will stay home and wait for the skies to clear. Of the two groups, the more intractable and irrational enemy wraps their rebellion in a flag of fundamentalist fervor. Although the press routinely lumps all of these similar groups under the banner "Al-Queda" (whatever that really is) there are actually five main extremist groups operating in Mosul. They have common ground. Some members seek fulfillment in apocalyptic visions of a world at war, wherein everybody except them—or even including them—dies. In other cases they see the war shaping a new world, one that is entirely Islamic. The word "extremist" is not an overstatement. These extremist are irrational, dangerous, often highly emotional, and cannot be trusted with large weapons. Every day they kill innocent people in Iraq. The FRE and most of the Iraqis tend to hate the extremists, realizing that if the Coalition were to leave, they would face the full wrath alone. The friendly forces in Iraq are also an amalgamation. In Iraq as a whole, the Coalition is comprised of soldiers from many countries. But here in Mosul, the "Coalition" is almost entirely US, charged with building the Iraqi Security Forces (ISF), while simultaneously keeping the insurgents at bay until the ISF can take over. Building the ISF is part of a larger plan that will allow our people to come home, but without leaving a wounded Iraq victim to septic fundamentalism from within, or invasion from opportunistic neighbors. 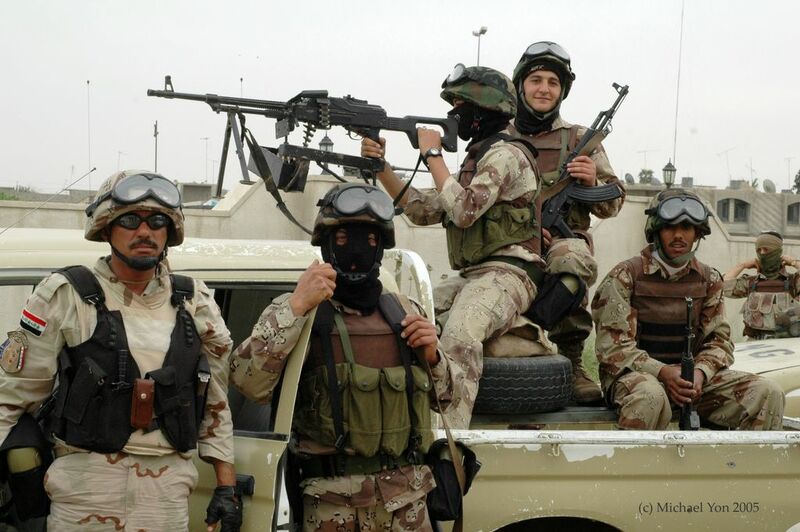 Some definitions: The ISF includes the Iraqi Police (IP), Iraqi Army (IA), Iraqi National Guard (ING), Border Patrol (BP), and sundry other groups, each with their own initials. Every month the ISF becomes a greater and more proximate threat to FRE and extremists groups throughout Iraq. This is borne out in a most ironic fashion; evidence of the growing competence and capability of ISF shouts from the headlines as the Iraqi government becomes the primary focus of insurgent attacks. In my own dispatches I rarely mention these successes, yet I see or hear about small operations every day, collecting in ever larger pools of confidence and stability. There's no time to write about each event; this would be like trying to describe every raindrop that hits the windshield while keeping up with a fast moving storm. Eventually, a competent witness must stop taking mere notes, and step back to see the storm for what it is. The next dispatch will explain how Deuce-Four has captured nearly one-hundred insurgents in the past three weeks, and how three drugged-up foreign homicide bombers were caught last night.